Matthews Family Farm of Davie County won the annual North Carolina Soybean Yield Contest for the second year in a row with an entry of 104.5 bushels per acre. Kevin Matthews received the award for the highest yield at the annual NC Commodities Conference of the corn, cotton, small grains and soybean associations in Durham, N.C. The soybean yield contest is administered by North Carolina State University Cooperative Extension and the awards are sponsored by the North Carolina Soybean Producers Association. The winning entries were announced on Jan. 10, 2019. Matthews (pictured left receiving his award from NCSPA president John Fleming, with Rachel Vann, N.C. State Extension Soybean Specialist and Marsha McGraw, Davie County extension agent) was awarded a plaque and one expense-paid trip to Commodity Classic, the national conference and trade show for the U.S. corn, sorghum, soybean and wheat industries, in Orlando, Fla. on Feb. 27- Mar. 2 2019. Davie County extension agent Marsha McGraw was the soybean agent for Matthews’ entry. McGraw will receive one expense-paid trip to Commodity Classic for her role in producing the winning yield. Johnny Moore of Iredell County was runner-up with a yield of 94 bushels per acre. The Iredell County soybean agent assisting with production was Laura Elmore. There was a tie for the third-place award between Doug and Billy Mercer of Pasquotank County and James Allen of 4Gen Farms in Washington County, both with yields of 91.5 bushels per acre. The soybean agent for the Mercer’s entry was Alton Wood and the agent for Allen’s entry was Rod Gurganus. (Southern Coastal Plain) – Locklear Brothers Farm of Robeson County, 84 bushels per acre; Mac Malloy was the agent. (Northern Coastal Plain) – Sharp Farms Inc. of Wilson County, 82.4 bushels per acre; Norman Harrell was the agent. In the annual Most Efficient Yield Contest, Temple Family Farms of Pasquotank County placed first in the state with a per bushel cost of $4.75. 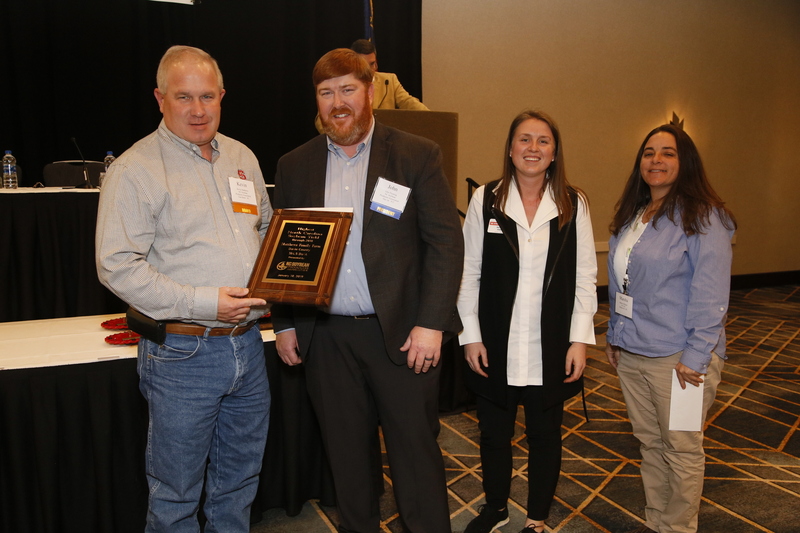 Temple Family Farms received the first-place award at the NC Commodities Conference on Jan. 10. Temple Family Farms received an expense-paid trip to the Commodity Classic in Orlando, Fla. from Feb. 27- Mar. 2, 2019. The Most Efficient Yield Contest rewards producers for achieving the lowest cost of production for soybeans on a per bushel basis. Other area winners in the most efficient yield contest were: (Southern Coastal Plain) – Locklear Brothers Farm of Robeson County, $5.80 per bushel; (Northern Coastal Plain) – Blizzard Farms Inc. of Greene County, $5.21 per bushel; (Southern Piedmont) – Jason Starnes of Rowan County, $5.35 per bushel; and (Northern Piedmont) – Matthews Family Farm of Davie County, $5.13 per bushel.